The Pioneer Lifeline is a tool for students that could quickly save a person’s life from an overdose on campus, but many students have unanswered questions about the resource and what it provides. However, the poster also states that the students involved may need to meet with the Director of Student Conduct, or may be referred for further assessment and services. There is no place online where a WPU student can find further information about what these assessments or services might be. The Director of Student Conduct said she was unable to comment about these student concerns, a week after being contacted, because her supervisor still had not given her permission. This leaves students wondering what exactly will happen if they call the lifeline. There is some confusion as to how the situation will be handled by the campus police and if there will be other responders. “There’s still a sense that the police will abuse authority because they believe they are always in the right,” Jailine Nunez, a Sophomore, explains. There was a sense of mistrust in many of the students interviewed, and this may be due to the lack of information that has been given about the exact protocol that is followed after the lifeline is called. The law Danielle is referring to is the Overdose Prevention Act of 2013, which was created to prevent overdose deaths by making it safe to call the police to report an overdose, without the fear of persecution. This law guarantees no legal punishment. 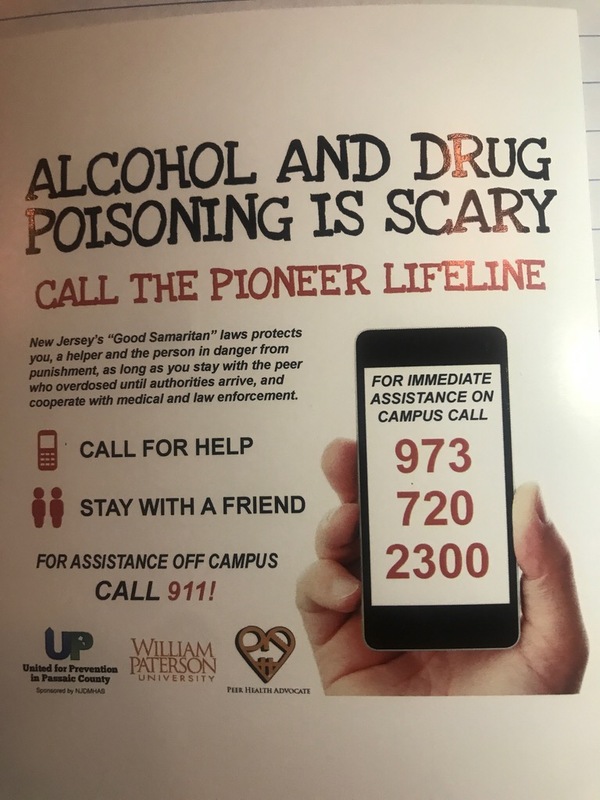 The pioneer lifeline is claiming to be an offshoot of this movement, but it does not specifically say that calling the lifeline will not lead to academic punishment. This concern goes against the spirit of the overdose prevention movement, and calls into question the reason why it exists at all. For student Nicole Szubart, a Junior, the purpose of the lifeline is a concern. “Obviously, you want to call to help your friend, you don’t want them to die, but there’s something suspicious about it. It sounds too good to be true. The lifeline might exist so that the incident isn’t reported directly to the town police, so the campus can appear more safe,” she said. Either way, the North Haledon Police Department confirmed that if you call 911 while on campus, campus police will be contacted. This means that the Lifeline is essentially the same as calling 911 when it comes to its effectiveness and protocol. This further calls into question its reason for existence. The Office of Student Conduct does not provide this information as well. With drug overdose deaths being the highest form of accidental death in the US today for 25-65 year olds, as reported on the WPU Lifeline information page, the university should be working to make sure all students feel safe reporting overdose incidents. The Lifeline’s vague presentation of the facts may cause hesitation, as many students fear academic prosecution as much as legal prosecution. Questions about the Pioneer Lifeline are important and should be addressed as so by the Office of Student Conduct. The Pioneer Lifeline has the potential to be a trusted resource for students, but the lack of information and clarification leaves students with doubts that could affect the Lifeline’s effectiveness. The Office should give the students a guarantee that they will not be academically affected if they truly want the Lifeline to be used in all life-or-death situations on campus. Despite the unanswered questions of students, if you are experiencing an emergency, do not hesitate to call the police.